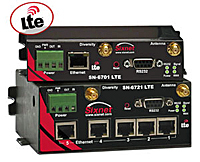 Sixnet Cellular Modems - Industrial Cellular Modems | PICS, Inc.
Sixnet is a leading manufacturer of industrial cellular modems for a variety of applications. With Ethernet and serial interfaces, cellular modems cost-effectively connect PLC’s, machine controllers and other remote devices to a central site or SCADA server. The industrial pro 6000 router saves space and is ideal for harsh industrial environments. Simple and easy setup and communication between SCADA servers, remote RTUs, PLC/controllers, and other devices. Supports 4G LTE, 3G, 2.5/2G and allows streaming video for monitoring applications. This device has many ways to secure and protect you valuable data (data encryption, VPN, and firewall configuration). Applications- Common applications are for power & energy, oil & gas, water & waste-water, transportation, video & security. The industrial pro 6000 modem provides connectivity to critical assets and devices at remote sites with secure high speed connection. Lowers costs by removing remote site visits with the modems real-time data access, monitoring, and control. The N-Tron 100 series is great at providing economical fast Ethernet switches, and other products that expand your Industrial Ethernet network. Great for unmanaged data acquisition, control and Ethernet I/O applications. The N-Tron series also has models with fiber ports offering more flexibility to your industrial Ethernet network. The 100 series also offers diverse port count options with compact size and high performance operation. These models provide auto sensing, auto negotiation, and full-wire speed communication. Fiber port option devices come with an extended range feature that tackles up to 80km. Many mounting options are possible with the compact device, and they can be deployed in Class 1, Division 2 hazardous locations. The N-Tron series also offers rugged unmanaged fast Ethernet switches that are rated IP67 for harsh environments ideal for critical data acquisition, control and Ethernet I/O applications. They are rated for protection against low and high pressure water jets, dust, and temporary emersion in water. These devices use standard M12 D-Coded connectors. The N-Tron 300 series offers Ethernet Switches are for mission critical applications where reliability and speed is necessary. Versions are available with only copper ports or with both fiber and copper ports. They are DIN rail mounted and handle complex and demanding needs of industrial communications and hazardous conditions.